Metina – Your Tuscan hideaway is ready to welcome you. Set in a wide enclosed garden, our two outbuildings and farmhouse offer you 5 self-catering apartments of different sizes, housing from 2 to 5 people each. 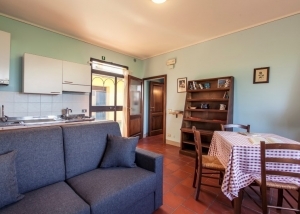 Each holiday accommodation has its own ground floor entrance, outside meal space with table and chairs, independent heating, fireplace, and TV with Italian channels. Private Wi-Fi is available throughout Metina. There is also a little surprise for book-lovers … a multilingual library created over the years by our guests. You are welcome to add to it by leaving a book you just finished and/or taking one away if you so please. The garden is completely steps-free and safe for children and disabled people, as well as dogs. Our swimming pool (15x7m) has a wide entrance ramp with handrail, for the convenience of all our guests, whatever their mobility. There is a patio with BBQ and wood-fire oven, which can be freely used, as well as laundry facilities. There are children’s garden games, including a paddling pool, and a cot and high-chair are available for babies and toddlers. And there is a reserved, covered parking area by the entrance gate. Menta and Origano are the perfect holiday accommodation for a couple or a young family. They each have a double or twin bedroom, in which a small bed for a child up to 8 years old can be added. Salvia and Timo are the ideal self-catering holiday accommodation for a family or two couples. With two bedrooms (double or twin), they can each house up to 5 people. Rosmarino our only holiday cottage on two storeys, can house up to 5 people in two bedrooms (double or twin).